Mr. Netanyahu, and Mr. Barkat, the Jerusalem mayor, called upon civilians to carry weapons and received full support for their request from Moshe Ya'alon, the minister of defense as well as from Yuval Diskin the previous head of the Israeli intelligence service. When Mr. Netanyahu calls the Jewish citizens to vote because, and I'm quoting "the Arabs are racing to the ballet boxes", when Israel's minister of education, Mr.Benet, declares, and I'm quoting "that it's OK to kill Arabs, I have actually done so several times", when Mr. Lieberman says "to use hatchet", the remarks indicate the central lesson from crystal night has not been learned. Crystal night didn't suddenly '' fall from the sky''', come out of nowhere, it was the result of a development over time. And we can see a similar development happening in Israel over the last several years. The quotes I just presented to you, justify the use of violence towards Palestinians. Yet the public keeps quiet. A majority of Israel's Jewish citizens agrees to place the Arab (Palestinian) citizens of the state under arrest in case of war. 55% Percent disagree with full equality for the Palestinian citizens inside Israel. It is easy to notice the gradual descend into a deep vale that reminds us of the Germany during the nineteen thirties. The demonization of the other, the justification of the use of force, and the lack of response in the face of crimes, are all reminiscent of what happened in Germany in the early thirties. Two weeks ago an Eritrean refugee, Haptom Zarhum, was lynched by a mob in the Beer Sheba central bus station. The general public conceived of the horrendous event as a case of ''mistaken identity'', the mob thought he was a terrorist, and not an innocent Jew. However, what is truly shocking, is that the public wasn't shocked by the act itself, but by the mistake in identity. Thus: if the victim had been a Palestinian, there would have been no problem at all. I can give you many more examples, from which can be learned, that the state of Israel is passing quickly through similar phases as Germany in the nineteen thirties. It's not de facto racism, but also de jura: what we are facing, is a political culture, which started with the very definition of the ideology of the state, which can be summarized in one sentence: to provide and guarantee privileges of the Jewish population, by means of a set of 80 laws. Each law by itself is perhaps not so problematic, however, when one looks upon the total of these 80 laws and law amendments, one cannot but understand the seriousness of the situation. I would need a few hours to go over all the laws, and my time is limited, so let me give you just a small example. For example there is a law that enables civil lawsuits against anyone who calls for a boycott. Boycotting is a peaceful tool of civil political struggle. Yet in Israel the call for a boycott has been effectively silenced by this law. Or let me tell you about villages that have special admission committees in order to filter out Palestinians, who want to move there. Can you imagine a village in Holland having an admission committee that allows the local villagers to prevent people from coming to live there, on the basis of ethnicity, race or religion? In Israel the police must record their investigations, but not in the case of people who are suspected of security offences. This creates an opportunity for abuse and even torture of suspects. And as it is also legal to prevent suspects of security offences to meet with their lawyer, the risk is great indeed. I could go on, but here is my last example: If you are married to a spouse from the Palestinian territories, you are not eligible for family reunification. Settlers who live in the territories and marry a spouse, who lives inside Israel, do not experience that problem, but Israeli Palestinians do. The question is: will we be able to stop this? Will we be able to learn from crystal night that we must not kill, we mustn't be racist and when faced with atrocities, we mustn't keep quiet? Otherwise, we become responsible. If you are silent in the face of racism and discrimination, you are responsible! I'm Haneen Zoabi, I'm one of the 120.000, which Israel didn't expel from their homeland, Palestine in 1948, when 85% of my people were expelled, in an ethnic cleansing and colonialist plan. And instead of recognizing this deep historical injustice, and establishing a state based upon equality, justice, democracy and human dignity, we live in a state which established itself upon the concept of "privileges to the Jews", reflecting a misunderstanding of their own tragedy. What should be learned and understood from the oppression, persecution, expulsion, and murder of Europe's Jews, is not to give privileges to Israel's Jewish population, but to live in equality. One cannot face racism towards you, by practicing racism towards others. On the contrary, one should face racism by seeking, demanding and practicing equality and democracy and justice for all. What I receive as a Palestinian, is a state promoting the belief that in order to "compensate" the Jews, I must suffer, and I must experience racism similar to what the Jews suffered in Germany in the 1930-ies. As a Palestinian, who has nothing to do with the racism that led to Crystal night, I identify with the victims, and I'm struggling their struggle, in the face of racism professed by Israel in their name. I am forced to live in an undemocratic racist legal and political system, based upon "privileges for Jewish citizens only", forgetting that I didn't immigrate to Israel, they are the ones who immigrated to the country. And Israel went one step further, it occupied my people, in the West Bank and Gaza and east Jerusalem, conducting massive crimes against humanity, war crimes, confiscating land, building settlements, exposing people to the violence of many settlers, putting my people into a siege, preventing basic human rights, dignity and freedom. During the last Gaza war Israel has killed 2200 Palestinians, 500 of them children. What can we do, except for struggling within the constraints of international law? What other human reaction I can practice? Yet Israel is criminalizing precisely that type of struggle, which any one of you would undertake if faced with a similar situation. Carrying the same harsh memory of Crystal day: we call for a popular struggle, within the constraints of international law, we call for a human struggle, against the same logic and against a lot of the same practices, we call for political struggle as citizens. I do not call for violence, I call for a struggle within the constraints of international law. I call upon you not to be silent in the face of the grave crimes my people face. 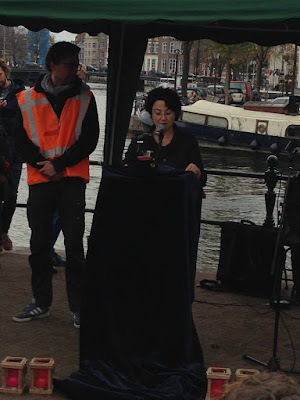 Een indrukwekkende toespraak van Haneen Zoabi op deze Kristalnacht herdenking. Al is morgen de "echte" herdenking volgend AT5. Jammer dat het niet anders kan.
Zijn de andere toespraken ook ergens na te lezen misschien. Ik zou ze ook nog even rustig door willen lezen. Alle respect voor deze prachtige vrouw. Dank ook aan het team dat haar uitnodigde. We zouden kunnen discussiëren over haar Engels (jouw Arabisch is vermoedelijk ook niet erg goed),maar niet over de door jou geconstateerde obsessies of iemand anders' verhouding tot zijn of haar geboorteland. Wie ben jij wel dat je mag uitmaken hoe andere mensen hun identiteit definiëren? Ga ja straks beweren dat ik geen Jood ben, omdat ik Zoabi uitnodig? 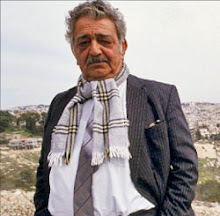 Net zoals je vindt dat Zoabi geen Palestijn mag zijn omdat ze in Nazareth is geboren en woont? Wat een schandalige racistische en kolonialistische houding. Jij maakt wel even uit wie zij qua identiteit is. En jij zal ook wel even bepalen wie er de Holocaust mag herdenken en waar. Je hebt totaal niet begrepen dat mevrouw Zoabi haar identiteit al had lang voordat ze geboren was en zelfs voordat de eerste Jood in Palestina een nederzetting begon. Het is je ook ontgaan dat zij, in tegenstelling tot een meerderheid van Israelische Joden, oproept om in volledige gelijkheid - zonder etnische privileges of discriminatie - in een democratisch Israel te leven. Ook jij bent aan een dergelijke houding in de eerstkomende jaren zo te zien nog lang niet toe. Ga jezelf opvoeden tot een fatsoenlijk mens, dat is het enige wat ik je te zeggen heb. Je bent inderdaad niet joods. In opinie artikel NRC d.d.09.11.2015 van Sebastiaan Valkenberg stond dat Zoabi geweld verheerlijkt. Vreemd dat BDS tegelijkertijd zich bij Kristallnacht herdenking in Munchen plaatsvond. - Het kostte mij geen enkele moeite de toespraak van Haneen Zoabi te volgen. Gelukkig voor u kunt u haar verhaal hierboven nog eens rustig nalezen. - Voorzover Zoabi zich over ‘The Jews’ uitliet, lag dat a) besloten in het thema van de bijeenkomst (u weet wel, de Kristallnacht), en was dat b) om de bevoorrechting van joden boven niet-joden in Israël aan de kaak te stellen. Mocht u dat zijn ontgaan, dan kunt u het hierboven nog eens nalezen. - Het is niet aan u om uit te maken wie wel en wie niet het recht heeft om tijdens een Kristallnacht-herdenking te spreken, en uw indruk dat Zoabi ‘Israël haat’ is daarbij niet relevant. - Met uw curieuze stelling dat Zoabi geen Palestijnse is, onderstreept u het belang van Zoabi’s aanwezigheid en toespraak. - Israël heeft geen Zoabi nodig om zich te schande te maken; dat lukt het land uitstekend op eigen kracht.